Does your business take steps to mitigate its impact on climate change? As a sales and marketing company, our UK operations are office-based and our primary sources of GHG emissions are from the electricity used to power our office buildings and the vehicles used by our sales staff and field engineers. KDUK is part of a global environmental management system (EMS) operated by its parent company which monitors, analyses and reports its Scope 1 and 2 emissions annually. The EMS contains national targets for reducing carbon emissions, which are calculated according to the GHG protocol. It complies with ISO14001 and is subject to internal and external audits. As an element of our EMS, climate change is the responsibility of the HR Director on the UK board and she reports monthly on our environmental KPIs to our regional HQ in the Netherlands who in turn report to the global EMS owner in Japan. The products we sell are specifically designed to reduce resource consumption by typically 80% compared to equivalent products from others in our industry. Conventional printers and multifunctional devices are designed such that, whenever the black toner powder runs out, the entire print engine is replaced as it is contained in the consumable cartridge. By applying its expertise in ceramics, Kyocera was able to design a printer with a print drum durable enough to last up to 1 million pages which in turn allowed all the other components to be designed for extended life. By housing these components permanently in the machine, Kyocera removed the necessity to replace them periodically - the resulting products are described as cartridge-free. 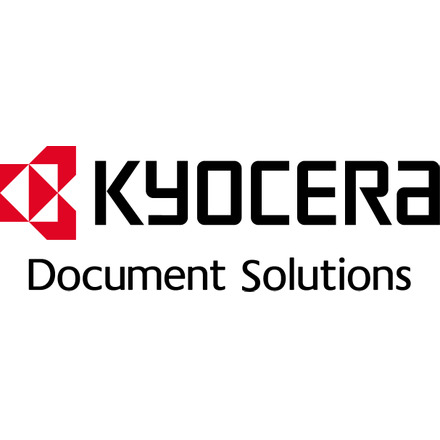 This concept, called Ecosys, has been the design philosophy behind Kyocera products since 1992 and now applies to every single printer it manufactures. As well as reducing waste by typically 80%, the cartridge-free design also reduces manufacturing and transport emissions as fewer raw materials are needed, the manufacturing process is simpler and the consumable significantly lighter. (more info at http://www.kyoceradocumentsolutions.co.uk/index/products/sustainable_design.html) More recently KDUK has built on this hardware design advantage by transforming its business model, migrating from a product-led approach to the provision of managed document services. This is an example of the product to service shift which is a key component of the Circular Economy, and enables customers to reduce their energy use and paper consumption by reducing reliance on printed documents to share information. We don’t operate a local offsetting scheme, however since 2013 the emissions displaced by the solar division of our parent company has been greater than the emissions of the entire global Kyocera group. By 2020, it is intended that the carbon benefit delivered by the solar division will be 3x the group’s impact. KDUK's CO2 emissions target is 1% reduction in carbon intensity year on year. For the period April 2013 to March 2014 inclusive, its carbon footprint was 777.6 tonnes of CO2 equivalent and its turnover was £78M. This equates to 9.97 tonnes per £1M of revenue. In the previous year the emissions were 664.72 and revenue was £72.75M, equivalent to 9.26 tonnes per £1M. Carbon intensity therefore increased by 7.6% over this period. While this is not ideal, it is attributable in its entirety to the insourcing of national field support which was previously outsourced. The travel emissions of a team of national field engineers has been transferred from an outsourced provider to KDUK's own footprint; this was a one-off occurrence and we expect to return to reductions from FY14 onwards. Renewable energy is purchased for company offices wherever we have freedom to source supplier (in locations where we are a sub-tenant, this is not possible as the landlord purchases energy on behalf of the entire building). There is a carbon emissions limit of 170g/km on all company vehicles for which the employee has a choice of model. For field engineers, where a standard vehicle model is purchased for all operatives, we have selected the vehicle with the lowest emissions that fit the other technical specifications. When purchasing white goods, a model is selected from the most energy-efficient band – depending on the type of equipment the actual category varies as labelling scales have been extended upwards into A+, A++, A+++ etc. For dishwashers, water-efficiency is also taken into consideration. We look for products that have good overall water efficiency rather than one eco-setting, as we cannot be certain that eco-settings will be used by our cleaning staff on every occasion. When purchasing ICT equipment we consider not just which hardware to buy but also how to optimise hardware use. First we consider the most efficient way of meeting the functional need – so, for example, servers can be virtualised to reduce the amount of hardware needed (and therefore the energy consumed) – then we select hardware that is energy efficient. Our desktop services have been migrated to all-in-one PCs which have a lower energy profile than separate processors and screens as well as having lower embodied energy. We have installed unified communications software that provides rich communications media on every desktop, so that staff can hold conference calls, web-exes and videoconferences without leaving their desks. We have a “switch off when you leave” policy that is so well-observed by staff that when a supplier of automatic switch-off solutions audited our HQ they were unable to recommend their product as there was so little scope for improvement. Occasional focus days are held to reinforce this behaviour, coincident with Earth Hour and other national/international days of action. When we relocated our UK HQ August 2013 we set a target of achieving the most energy and resource efficient building possible and not sending any of our surplus furniture and equipment to landfill. We adopted the SKA Gold standard as the benchmark for best practice and appointed a contractor with experience of delivering highly environmentally efficient buildings. With their guidance, we achieved the SKA Gold accreditation, becoming only the 37th project ever to do so. Due to the move our emissions baseline was interrupted and we have had to re-establish it based on the emissions profile of the new building. Its energy efficiency measures will make it challenging to achieve further improvement, but we are committed to doing so nevertheless. Other innovations include the use of on-demand hot tap water systems, no use of bottled water in our offices and a managed print service that is designed to reduce reliance on paper documents. This reduces both scope 2 and 3 emissions by reducing both energy and paper consumption. Since 2000 we have endeavoured to assist our customers to run more sustainable offices, initially through our Green Card Network - one of the very first sustainable business networks - and latterly as a dedicated section on our main website http://greenlight.kyocera.co.uk. We signpost information, advice and support available from authoritative organisations, focusing primarily on energy and resource efficiency. In 2012 we instigated the first Green Partner programme in our industry, which aims to encourage the intermediaries who resell our products to reduce their environmental impacts. There are two levels of accreditation, enabling it to both encourage those who are starting their sustainability journey and appropriately recognise those who have made significant progress. It is supported by a guide that provides advice on how to get started for those who need it. Climate change threatens the basic necessities of human life all around the world - access to water, food production, health, land, biodiversity, peace and stability. Climate change is an unprecedented issue, unique to our civilisation, and action is needed to prevent dangerous anthropogenic (human induced) interference with the climate system. Anthropogenic climate change is mostly caused by the release of greenhouse gases (GHGs) into the atmosphere. The United Nations Framework Convention on Climate Change (UNFCCC) has identified six key GHGs which contribute to climate change. While carbon dioxide (CO2) is one of the most common GHGs, all GHG emissions have impacts of varying intensities and timescales on climate change. Some GHGs trap heat in the atmosphere and the oceans for over a hundred years, while some do so for much shorter periods of times but with far greater magnitude. Methane (CH4), from leaked gas or livestock for example is such a gas. Feedback loops, which could accelerate climate change, add further urgency for action in order to prevent pushing the climate system beyond irreversible tipping points. Scientists fear that, as temperatures increase, huge stores of GHGs could be released into the atmosphere accelerating further warming. GHG emissions from businesses are generally classified in three different ‘scopes’, Scope 1, 2 and 3 emissions. ‘Downstream emissions’ are linked to life of the products or services. Examples include: investments, energy use associated with products and the end of life-treatment of products. Some businesses are not only reducing their GHG emissions to limit further climate change, they are also working to adapt to changes that have already occurred and will continue to occur. ‘Climate-smart agriculture’ is one example, where businesses may work with farmers and policymakers to strengthen irrigation systems so that the agricultural produce or livestock are better protected against droughts or floods. Such adaptions seen across various sectors and industries suggest that integrating climate change thinking may help identify associated opportunities and risks. Appointing someone in the business for energy management. Engaging with various of the elements of the organisations value chain on GHG emissions and climate change strategies. A comprehensive strategy to mitigate impacts on climate change forms a key part of an organisation’s ability to manage their environmental impact. There is no set way to mitigate an organisation’s impact on climate change and many innovative solutions continue to emerge from individual businesses, industry groups and others. Nonetheless, a company does not have to be expert or innovative to follow good practice. A company that considers sound environmental stewardship and reducing its footprint across its operations as good business practice will likely be able to cite numerous steps it takes – for example cutting down on its use of raw materials, reducing its use of transportation and considering end of life treatment – to mitigate its impact on climate change. By disclosing such steps, benefits include learning from each other, inspiring innovation and improving the business impact on the environment. 'Greenhouse gases' (GHGs) are gases in the atmosphere, both natural and anthropogenic (human induced), that absorb and emit radiation at certain wavelengths resulting in atmospheric warming known as the greenhouse effect. The six key GHGs as identified by the UNFCCC are CO2 (Carbon dioxide), CH4 (Methane), N2O (Nitrous oxide), PFCs (Perfluorocarbons), HFCs (Hydrofluorocarbons) and SF6 (Sulphur hexafluoride). Other GHGs as identified by the UNFCCC are SO2 (Sulfur Dioxide), NOx (Nitric Oxide), CO (Carbon Monoxide) and NMVOC (Non-methane volatile organic compounds). Positive: I admire the thorough approach that Kyocera have taken to this. Lots to learn from for our own approach - thank you!